Gilson Testing Screen - Gilson Co.
Gilson Testing Screens are ideal for particle size determinations on large samples of aggregate, slag, ores, and other coarse materials. Batch sizes up to one cubic foot (0.028m³) or more can be processed into six fractions in as little as three to five minutes, depending on material type. Vibration and amplitude characteristics are fixed at optimum for mineral aggregates in the 4in (101mm) to No. 4 (4.75mm) size range, but options and accessories are available for testing finer samples or special materials. Both Testing Screen models have the same performance characteristics and differ only in the clamping mechanism securing the screen trays during operation. The drive mechanism is completely enclosed for added safety and the powerful 1/2hp capacitor-type motor is operated with a starting switch with built in overload protection. 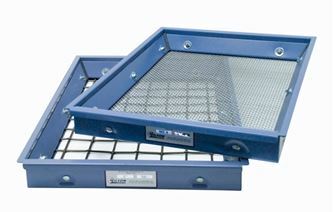 Independently removable Screen Trays and Dustpans are purchased separately and shared by both Testing Screen and Test-Master® models. 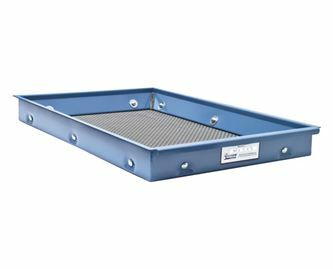 The Trays have replaceable Screen Cloth and are available in a wide range of opening sizes with ASTM E11 and ISO 565 specification cloth or punched steel plate. Gilson Testing Screens are designed to be mounted to a solid, rigid floor system. Securing with anchor bolts to a concrete floor is recommended. TS-1 Gilson Testing Screens use a quick-acting hydraulic pump system to clamp the screen trays in place. 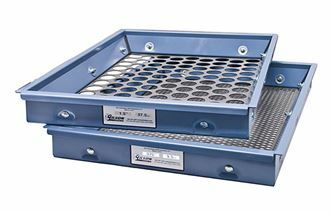 Trays are quickly released using the same handle. A total of six tray slots hold five Screen Trays plus a dust pan. This efficient model is recommended for labs with a steady workload of particle size testing. TS-2 Gilson Testing Screens secure the screen trays with manually operated screw-type clamping handles. This model is cost-effective but slightly more labor-intensive for continuous use. A total of six tray slots hold five Screen Trays plus a Dust Pan. TSA-155 or TSA-159 Hydraulic Clamping Conversion Kits are available to convert existing TS-2 models to hydraulic clamping TS-1 units. TS-3 Gilson Testing Screens feature an additional tray slot for samples requiring additional fractions. Hydraulic clamping system is the same as TS-1 with a reinforced top frame for the increased screen tray loads. Seven tray slots hold six Screen Trays plus a Dust Pan. TS-4 Gilson Silent Testing Screen is our newest model and offers a considerable reduction in operational noise and the elimination of nuisance dust during the screening process. The TS-4 Testing Screen integrates all the features of the TS-3 with the addition of a fully-enclosed, sound-dampened structure and an integrated digital LED timer for precise testing intervals. Door Enclosures are a lightweight panel minimizing dust and noise, and is easily removable.